Remember when kids played outside? When they were content to push a hoop with a stick... uphill both ways? Well, Semag Studio remembers. And that’s why we made Hoopity Stick, the best in hoop based action games! 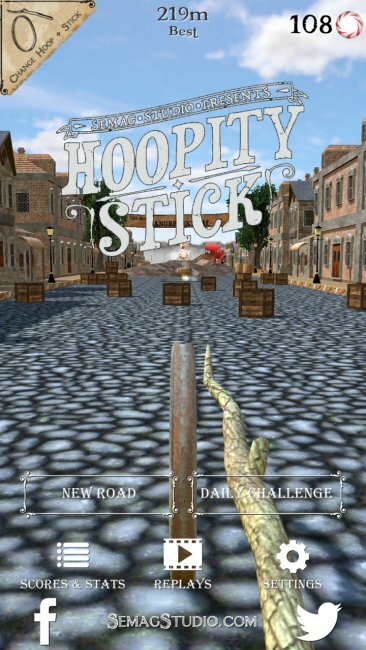 Hoopity Stick is a physics based twist on an infinite runner. No set lanes, no “jump and duck”. Just you swinging a stick to guide your hoop as best you can while collecting hard candies. Classic fun. Push your hoop down the street, past flaming cars, along narrow scaffolding, and over burst water pipes, you know, just a casual walk with your hoop and stick. And the hoop explodes if you fall over. Did I forget to mention that? Oh yeah, and sometimes it’s not a hoop… or a stick. Sometimes it’s more of an axe pushing a wheel of cheese, or a tire iron pushing a curled up snake. Or any of hundreds of other crazy hoop and stick combinations. Daily challenges force you to adapt to different hoop and stick combinations, testing your skill and creativity. Completing the daily challenge gives you bonus candies to spend on unlocking new hoops and sticks. How far can you push it? From the start, I think the first "Semag Studio" screen is a bit useless and doesn't really provide any value to the user. A lot of the text is hard to read, I feel like the game was made for a tablet. Some examples of hard to read text: the "Daily Challenge" button on the main menu, almost all the text on the Store menu. I think I may have found a bug. After the first time that I lost, I received the option to spin, I tapped the "Spin!" button, the little arm started spinning and then the game quit to my home screen. Just for debugging purposes, I'm on a Galaxy S5. The spinning worked fine the second time I started the game. - I really like that I was able to start playing directly from the start menu, just had to swipe up. It felt pretty intuitive. - I love the "old timey" atmosphere you've got going, it gives the game a very polished feel. - I think you've got the physics of the wheel spot on, nice job on that! - The camera spin that occurs after you loose feels really fast. Amorobic! gameWhat do we do now? Pay Attention! Watch my HAND!Move to RIGHT!Lets Try Squat, Down and... UP!Try to keep it up. Amorobic is music game, follow the instructor's move and get the best score, show it to your friend. Hey there Summoner,The goal in Poro Jump is to jump as high as possible and avoid the walls. Earn different kind of medals like Bronze, Silver, Gold, Platinum, Diamond, Master,Challenger and Legendary!Compare highscores on the leaderboard.Share your points with your friends and look who can jump the highest.Medal Awards:Bronze: 5Silver: 12Gold: 21Platinum: 34Diamond: 55Master: 75Challenger: ??Legendary: ? ?Are you Legendary? 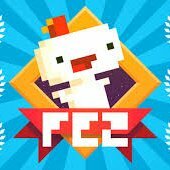 Download Poro Jump and Play Now! Tip for you summoner: Avoid the walls above you by letting your poro fall down a bit.Poros live in the Abyss in League of Legends where it always snows. Klepto is a VR supported burglary simulation game coming to Steam this Spring. Key Features:Oculus/Vive Support Multiplayer Sandbox neighborhoods (50+ homes per neighborhood) Hacking sim For more information visit our Steam Greenlight page. Mind the outdated Greenlight trailer. We've got an updated one releasing soon! Team Klaus Klapper is made up of a programmer and an artist. We've known each other for quite some time but never really got around to make a game. The MiniLD65 of the excellent Ludum Dare! seemed like an excellent way to get started. We just finished the game a few days ago and would love some feedback from you guys, doesn't matter if you leave it here or on the project page. There is no download, no payments or donations. Just go ahead, play the game and tell us what you think. We'll appreciate every opinion :) Teenage Mutant Super Hero! You're a 12 year old boy and love Teenage Mutant Ninja Turtles. Soon, you'll be a teenager. The only thing you miss are some rad mutation super powers! That couldn't be too hard, right? Join the epic quest of becoming a Teenage Mutant Super Hero. Can you make it until you're out of your teens? There are many many ways to die and also 7 different endings, if you made it out alive. So feel free to explore and enjoy yourself. There is no ingame tutorial of any sort yet and probably still some bugs and glitches as well as lots of balancing to do. You have a total of 32 moves (8 years * 4 quarters). After each move, your character might mutate in respect to your current mutation chance. The best way to win is to find a smart way of raising your chance to mutate as fast as possible. Your IQ determines the actions your character can do. Every action will have an effect on your chance to mutate, your health and your IQ. Try to find a good balance between a high IQ, high life and high chance to mutate.